Tight gubernatorial and Senate races in Florida have triggered an automatic recount. 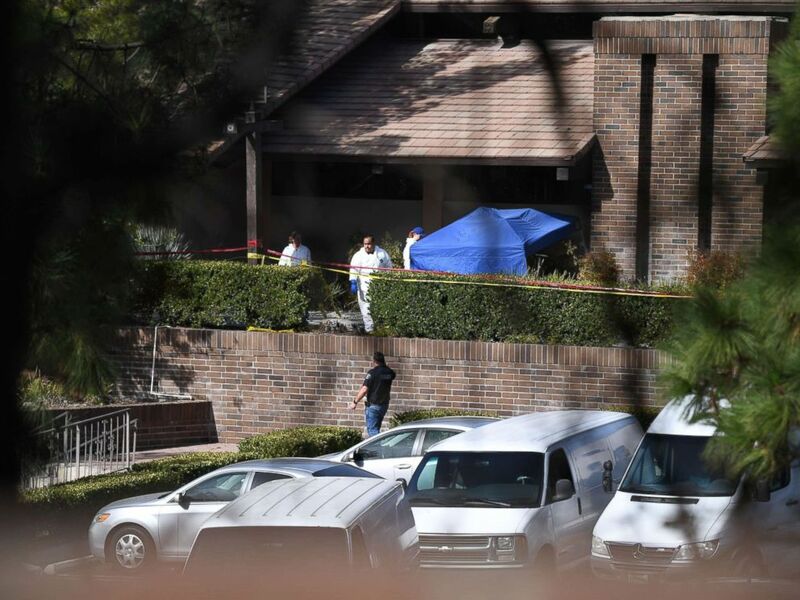 Officials in California say the suspected gunman in the mass shooting in Thousand Oaks, California, died of a self-inflicted gunshot wound. President Trump's decision to skip a ceremony in France honoring fallen American WWI soldiers because of bad weather creates a major backlash. Michelle Obama gives an exclusive interview to "Good Morning America" co-anchor Robin Roberts about her new memoir, "Becoming." A tweet by the president blaming California wildfires on poor "forest management" and threatening to pull federal emergency money prompts fury from Hollywood celebrities. Before you begin your week, take a look back at some of the top stories of the weekend. 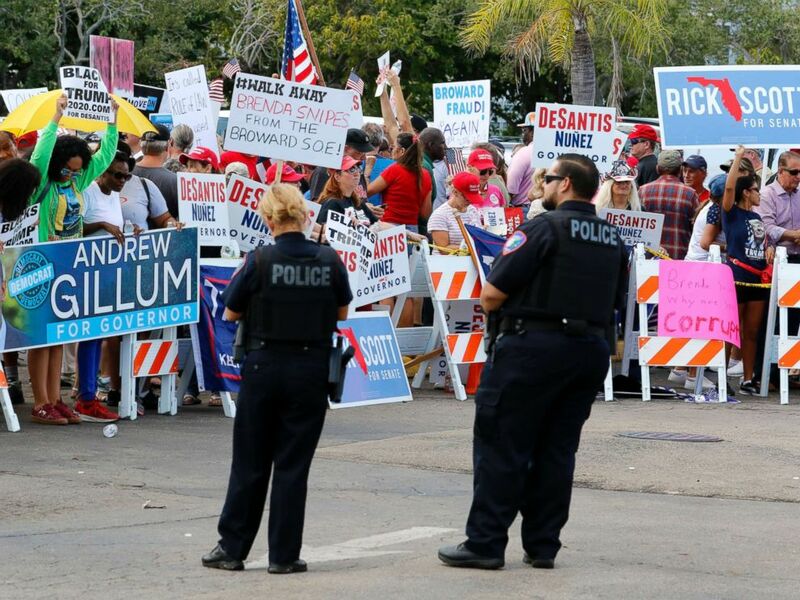 Protesters demonstrate outside the Broward County Supervisor of Elections office on Nov. 10, 2018 in Lauderhill, Fla.
Florida Secretary of State Ken Detzner has ordered a machine recount of the Senate, gubernatorial and agricultural commissioner races. Both the Senate and gubernatorial race had a lower than .5 percentage-point margin between candidates. On Saturday, Democratic gubernatorial candidate Andrew Gillum said he retracted his earlier concession to his Republican opponent, Ron DeSantis, and replaced it with a "call to count every vote." 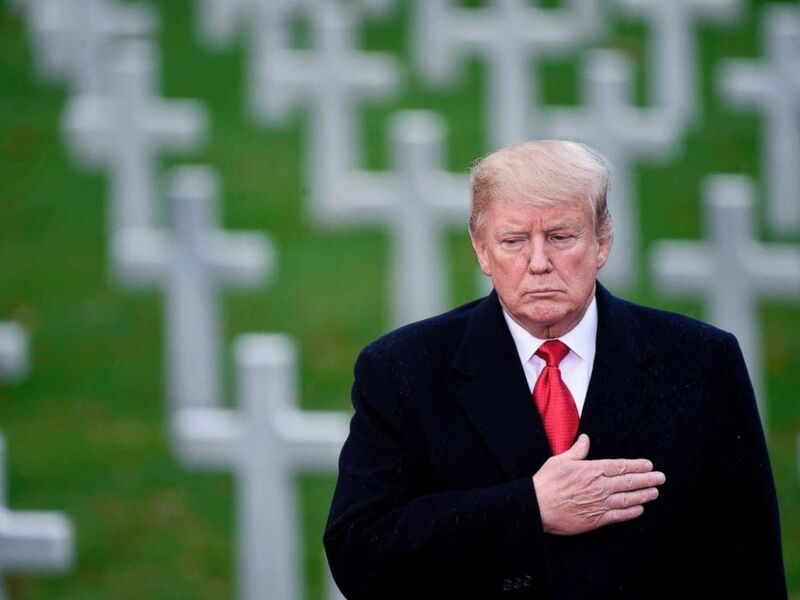 President Donald Trump visits the American Cemetery of Suresnes, outside of Paris, Nov. 11, 2018. President Trump decided to skip a ceremony on Saturday honoring fallen WWI American soldiers because of bad weather. Backlash to the decision grew as photos of other world leaders circulated -- including Emmanuel Macron, Angela Merkel, Justin Trudeau and Vladimir Putin -- who paid their respects despite the rain. Nicholas Soames, the grandson of Winston Churchill, tweeted his outrage, saying that "pathetic inadequate @realDonaldTrump couldn't even defy the weather to pay his respects to The Fallen..."
Investigators work at the scene of a mass shooting at the Borderline Bar & Grill in Thousand Oaks, Calif., November 8, 2018. Ian David Long, 28, who allegedly shot 12 people, including a police officer, at the Borderline Bar and Grill in Thousand Oaks, California, last week shot himself to death, officials said. Neighbors said Long, who lived near the bar, was troubled, had fits of rage, and seemed to be "struggling with some issues internally." Former first lady Michelle Obama speaks to ABC News' Robin Roberts for a prime-time ABC special on her memoir, "Becoming." In an ABC News exclusive, former first lady Michelle Obama told "Good Morning America" co-host Robin Roberts that the criticism aimed at her during her husband's campaign was "hurtful," and that even though she gave him her blessing to run, she didn't think he would win. Obama also said that she would "never forgive" President Trump for challenging the legitimacy of her husband's citizenship with his "birther" allegations. 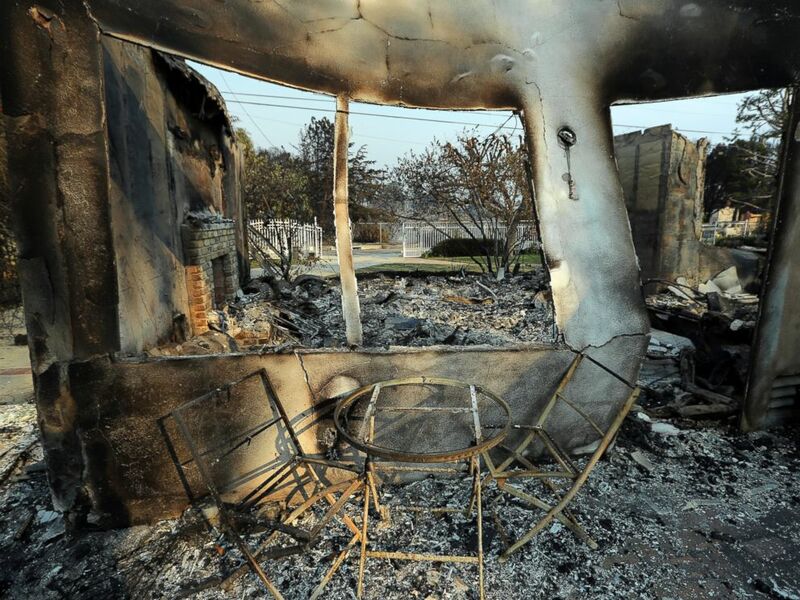 A table and chairs stand outside of one of at least 20 homes destroyed just on Windermere Drive in the Point Dume area of Malibu, Calif., Saturday, Nov. 10, 2018. Known as the Woolsey Fire, it has consumed thousands of acres and dozens of homes. President Trump tweeted early Saturday morning that he blamed the California wildfires on "gross mismanagement of the forests," and that unless this changed, there would be "no more Fed payments!" Sarah Silverman, Katy Perry, Bette Midler and Billy Eichner were just a handful of celebrities who spoke out against the president's tweet.